The 10th PATA Days, which were planned for September 2019 in Israel, have to be cancelled. The next regular PATA meeting will therefore be held in Chile 2020. This is the bad news. 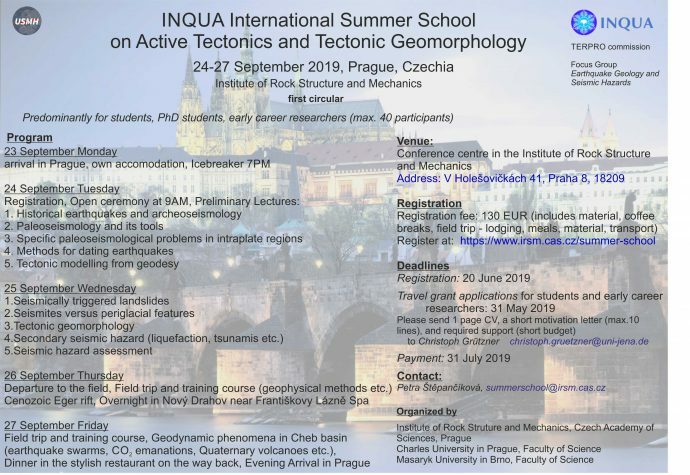 The good news is that there will be a student summer school organized by the IFG EGSHaz from 24-27 September, 2019, in Prague (Czech Republic). Petra Štěpančíková and her team are currently working on the schedule. The summer school will mainly address students and PhD students interested in earthquake geology, paleoseismology, and tectonic geomorphology. We will likely have two days of lectures & exercises and two days of field trips. More information will be available soon, so stay tuned. See you in Dublin and Prague! 24 June 2018: Kassandra field trip (starts in Thessaloniki and finishes in Possidi). 25-27 June 2018: Workshop at Possidi Holidays Resort & Suites Hotel (oral sessions) and the Aristotle University’s camping (poster sessions and events). This is the main event of PATA days 2018. 28 June 2018: Summer School at the Aristotle University’s camping. 29 June 2018: Mygdonia basin field trip (starts in Possidi and finishes in Thessaloniki). You may register for any event, or even all of them. Registration costs cover attendance, the proceedings volume, conference material, coffee breaks, lunches and dinners, as well as social events. Limited grants are also available for early-stage researchers. Please consult the relevant page for requirements and information ​on how to apply. 2) You’ll have the right to vote for the new TERPRO leadership! early career researchers and researchers from developing countries. You joining TERPRO will help to continue that amazing work and to support PATA Days, ECRs & DCRs in the future. So please register!